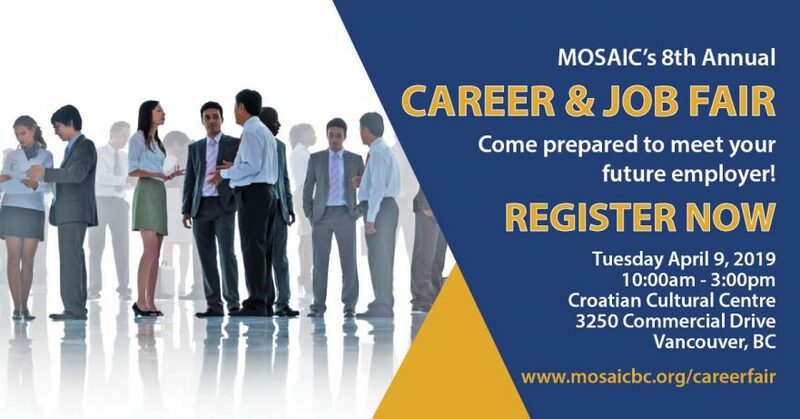 The MOSAIC Career & Job Fair brings together employers, qualified professionals, skilled workers, and entry-level individuals. Each year, we work with over a dozen media outlets to promote this event which attracts over 2000 job seekers and a diverse group of over 70 employers ranging from business, IT hospitality, trades, healthcare, retail and customer service. Please note: Due to space limitations, exhibitor space will be confirmed on a first come, first served basis, so don’t delay submitting the Employer Registration form for your organization. Feedback from previous exhibitor participants indicates that the diversity of candidates at MOSAIC’s job fairs is what motivates them to return each year to recruit qualified job-seekers. Cancellations received on or before March 25, 2019 will be refunded 50%. Refunds are not available after March 25, 2019. Cancellations must be received in writing to jobfair@mosaicbc.org.